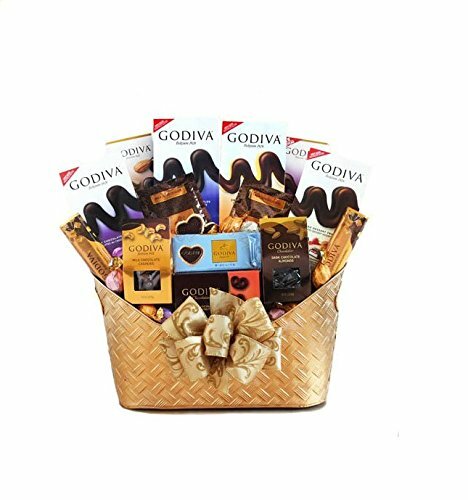 For the ultimate Godiva experience, this majestic gift fulfills every Godiva wish. An ornate metal container holds a huge array of chocolate Godiva deliciousness. They will enjoy dark chocolate almonds, Godiva white chocolate truffles, chocolate covered cashews, Godiva heart-shaped signature biscuits, solid Godiva milk and white chocolate bars, chocolate dipped pretzels, creamy Godiva hot cocoa, a Godiva milk chocolate hazelnut bar, salted toffee caramels, Godiva dark French vanilla truffles, a white chocolate vanilla bean bar and Godiva milk chocolate caramels. Truly majestic.